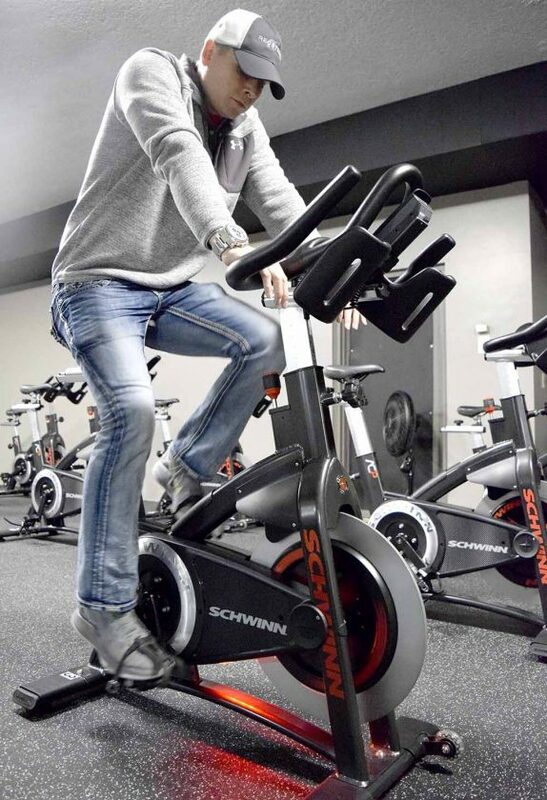 REC Associate Director Matt Hanson demonstrates how the new fitness bikes light up when used. 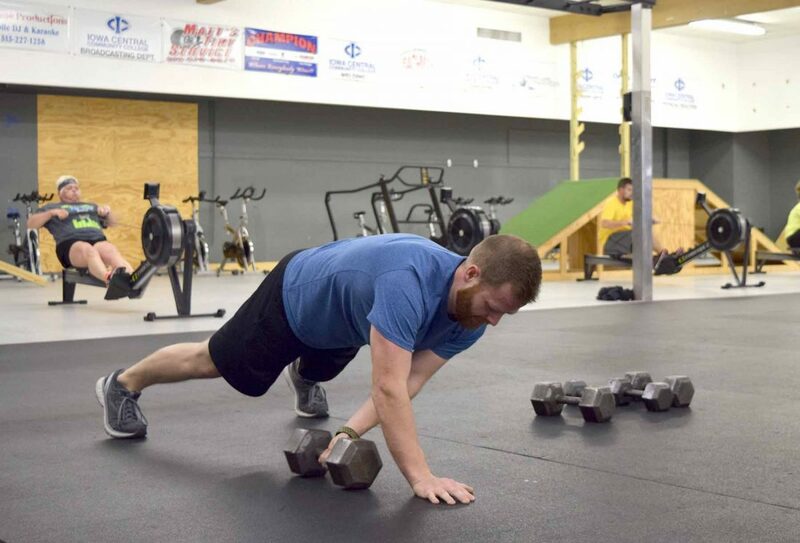 Stephan Cook takes part in one of the multi-stage workouts at the REC Colesium, which provides fitness and strength training using a variety of equipment at once. REC Associate Director Matt Hanson looks over the smaller strength training room where new machines have been installed at the REC, in this image made from multiple photos. Several machines in this room are new to the facility. Renovations and staying up-to-date are a focus at the REC in downtown Fort Dodge. That’s why the recreation and fitness center has put close to $180,000 into new equipment and building improvements, said Dave Pearson, executive director. “We had $50,000 just in the spin studio,” Associate Director Matt Hanson said. A few years ago, there was a big focus on the cardio room upstairs, Hanson said. This past year, the focus moved to downstairs. “We’ve been putting a lot of money and effort into redoing that downstairs weight room,” Hanson said. “We’ve done it in two phases. The first phase we did early in the year, when we replaced a lot of equipment in the larger room of our strength room. That includes new types of strength equipment, like a hack squat machine and a leg press. The spin studio also has all new bikes this year. “It’s an amazing transformation there,” Hanson said. Each of the REC’s locations — downtown, at Iowa Central Community College, and the coliseum — has a unique feel to it, Pearson said. Officials on the REC’s governing board continue to consider how to find a new location for the main downtown center, although there’s not much that can be said about it yet. The city of Fort Dodge recently did not get a grant it was hoping for to build a parking ramp downtown, which would have been part of moving the REC to a new building connected to the Warden Plaza. The plan to move near the Warden came to light after earlier plans, to tear down the Coliseum and build a new larger facility at that location near the curve in First Avenue South, also did not come to fruition. In the meantime, the REC is taking advantage of what it has, including new classes at the Coliseum. Pulse Experience classes Tuesday and Thursday mornings give participants a heart monitor to display vital signs as they’re doing the workout. “They can monitor their heart rate, see what zone they’re in so they can better calculate their workout and see where they are,” Pearson said. “So they’re getting that maximum benefit. A great number of classes are offered between the different buildings, from spin class to hot yoga to water aerobics, all included with the price of membership. “The heart and soul of the REC is those fitness classes,” Pearson said. “We try to make fitness as enjoyable and as fun as possible, and the relationships build from there. If you have people seeing results and building that camaraderie, you keep a long-term member.